Meadowland Farm is a successful family-run business, bought in 2004 by Debbie, John and daughter Megan. 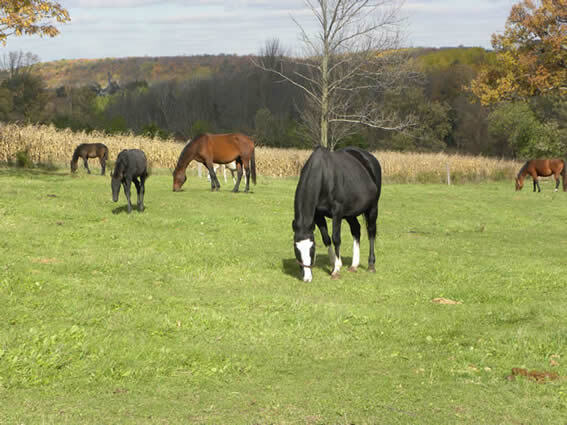 We opened in 2004 and quickly became a thriving boarding stables and home to around 50 horses. This historic farm, first cultivated over 150 years ago is spread over beautiful, gently undulating countryside with trails winding through the beautiful woodland; comprising elm, oak, maple and red cedar. Wildlife abounds on and around the farm, with wild turkey, rabbits, whitetail deer and coyotes. The farm has many fabulous trails on site and offers direct access to a vast network of trails. In 2014 Megan and her husband John took over the farm and as John is a dairy and crop farmer, some of the young Holstein calves and cows from his father's much larger neighbouring farm, live at Meadowland Farm now, alongside the horses who continue to live there. The facilities include 65ft sand round pen and outdoor sand arena. Meadowland High Pointe was purchased in 2014 by Debbie and John and we relocated many of our existing and long-term boarding clients to this farm in Baltimore, just minutes outside of Cobourg. MHP is more of an equestrian facility, with one of the largest indoor arenas in the area, a huge outdoor arena and another smaller outdoor arena. We have 30 large stalls fitted with rubber matting and auto water. The horse barn is heated in the winter and has a climate control cooling system for in the summer. We have 2 washstalls with hot and cold water, two tack rooms and a large viewing lounge apartment with fully fitted kitchen, bathroom, bedroom. Comfy leather sofas overlook the indoor arena. This farm is located at the top of beautiful Alnwick Hill and offers direct access to the Northumberland Forest and all of its fantastic trails.